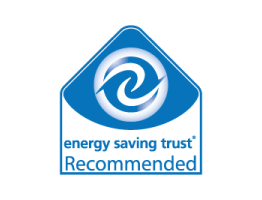 Energy efficiency is becoming increasingly more important in our world of rising fuel costs, so it is essential that you make the right decision when it comes to the energy ratings of the windows in your Essex home. All of our double glazing is A + 10 rated so you will always receive the very best thermal efficiency and insulation. 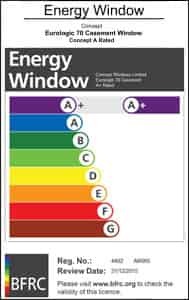 A Window Energy Rating (WER) is a classification appointed by the British Fenestration Rating Council (BFRC). BFRC are the leading UK authority for independently verified ratings. 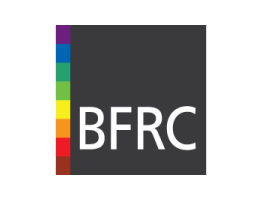 BRFC rated doors and windows are recognised by a ‘rainbow’ label, which uses colour coding to signify rankings, ranging from G-A (lowest to highest). The energy efficiency of a door or a window is judged primarily by the data received from its U-Value and G-Value rating. U-Value revolves around heat insulation, i.e. the amount of heat exiting your home in Essex, Hornchurch or Edgware. The lower the rating, the less heat is escaping, and the more thermally efficient your home will be. A lower U-Value is essential in allowing you to save on your energy bills. Improved heat retention requires you to heat your property less frequently, resulting in lower heating bills. G-Value considers the solar energy transmittance of glass. If a window has a higher solar energy transmittance rating, the more your home is heated by the sun. Solar heat gain is beneficial in the winter, but can cause your property in Essex to overheat in the summer, so make sure your window or door has a ventilation feature in order to maximise energy management. Energy efficiency is good for the environment and your wallet. The more energy efficient your property in Essex is, the less energy you will use and the more money you will save. You also have the added benefit of having a more eco-friendly home which is very important when it comes to lowering carbon emissions. Concept Windows and Conservatories always use ‘A’ rated glazing as standard, because we know that these will keep your property in Essex, Hornchurch or Edgware warmer and save you money on your heating bills. ‘A’ rated windows, doors and conservatories are specifically designed to keep your home or conservatory weather proof, insulated and efficient. Not only will our energy efficient windows save you money, but they will also contribute to saving the planet, lowering your carbon footprint and creating a greener environment. Did you know approximately 25-30% of heat loss in a house is lost through the windows which is why our ‘A’ rated windows are cleverly designed save you 25-30% from your heating costs. For example, if you pay £1000 per annum on fuel costs for your home in Essex, you could be saving at least £300 thanks to your new double glazing. This isn’t to say however that ‘C’ rated windows won’t perform sufficiently. They will still save you a considerable amount on your heating costs as well. Here at Concept Windows and Conservatories, our double glazing performs 80% more efficiently than standard double glazed windows. Over a period of 10 years it would be fair to assume our windows would repay their cost over and above the benefits of low maintenance and sound insulation. 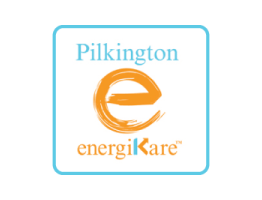 We can help make your home more energy efficient. Whether you live in Essex, Hornchurch, Edgware or the surrounding areas, call us for advice and prices. If you require more information on energy efficiency, don’t delay in contacting us today. We cover Essex, Hornchurch, Edgware and other areas too. If you’d prefer to speak to someone, give us a call on 0800 289 299. Also have a look at our doors, windows, conservatories and other products for advice.